We offer subsidised training that is part funded in the skills that you need. We plan coordinate and run the training for you. With access to the best trainers, we can tailor the training to you business needs. Membership to Gréasán na Meán Skillnet is free and is open to businesses including sole traders and freelancers. 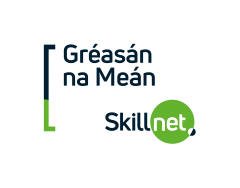 You can join the Gréasán na Meán Skillnet automatically by taking part in any of our bespoke training programmes.